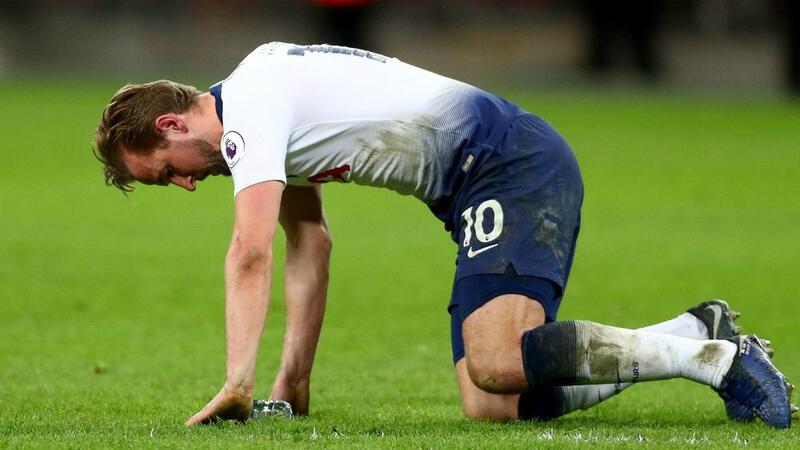 Tottenham's battle for honours on four fronts was dealt a body blow on Tuesday after the Premier League club confirmed Harry Kane will be out of action until early March. The England captain went down during the closing stages of Sunday's 1-0 Premier League defeat to Manchester United at Wembley and has sustained damaged ligaments in his left ankle. A slated return of early March means Tottenham's star striker will miss key clashes in the top flight, FA Cup, EFL Cup - possibly a final – and probably both legs of the Champions League last-16 clash with Borussia Dortmund. 60.9 – Tottenham's win percentages with and without Kane in all competitions are 57 per cent and 55 per cent respectively since Pochettino took charge at the start of the 2014-15 season. However, in the Premier League they have won in excess of 60 per cent of games – a return that plummets to 38.5 (five out of 13) when Kane is not involved. 2 – Another statistic that – if you're taking an optimistic view – bodes relatively well for Tottenham's prospects in the knockout competitions. Under Pochettino, they average 1.9 goals per game across the board, irrespective of whether Kane plays. But in Premier League matches an average of finding the net twice every match when Kane is around falls to 1.2 without. 119 – During the Pochettino era, Kane has scored a league-high 119 goals – 36 per cent of Spurs' overall 333 in the Premier League. 13 – Leicester City will be relieved that do not have to deal with their one-time loanee on February 10. Kane has 13 goals in 12 appearances versus the Foxes, with only eight of those starts. It amounts to a goal every 60 minutes. 56.8 – Tottenham's win percentage in all competitions with Fernando Llorente in the side, since Kane's most likely replacement joined on deadline day in August 2017. That climbs to 70 per cent in all competitions when he doesn't play, while the Premier League differential is wider – 50 to 76.5 per cent.